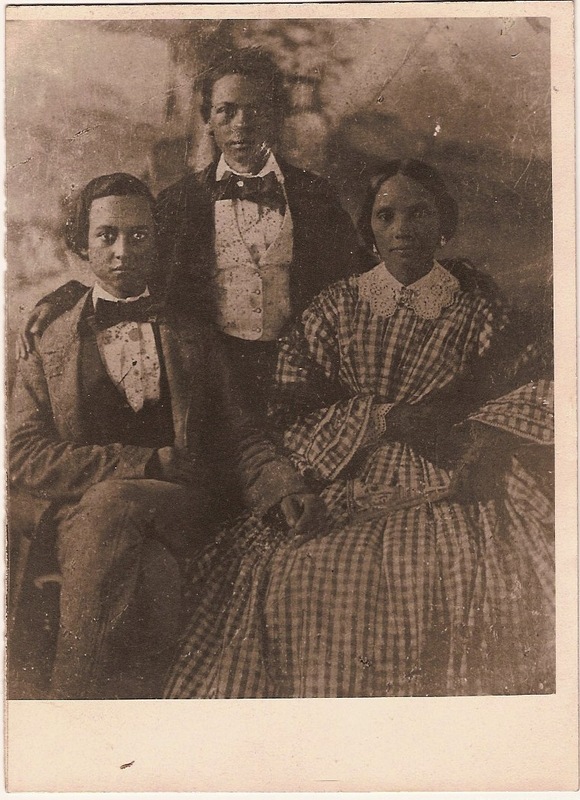 In this blog post I will chronicle the Native American/”free colored” Anderson family from their origins in Norfolk, VA to their relocation in Granville County. The origins of the Anderson family are interconnected to the Nansemond Indian Bass family. If you have not already, please read my blog entry on the Basses to familiarize yourself with that history. Unlike the vast majority of the family lineages of Native Americans in Granville County whose ancestors were always free born, the Andersons were once enslaved. 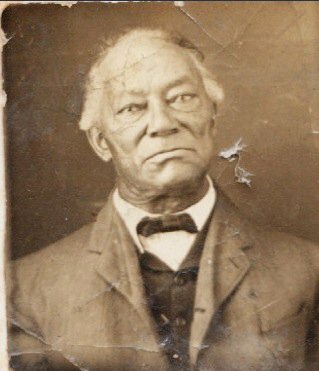 So before I delve into the Anderson family, I’ll need to first discuss their former slave owner – John Fulcher. Much of the source material for this blog entry comes from the excellent research provided by Fulcher descendant Ellen Fulcher Cloud on her website that can be found here. I also drew from Paul Heinegg’s research on the Andersons. John Fulcher (1666-1712) was born to English colonist Captain Thomas Fulcher and Mary Sibsey (daughter of Captain John Sibsey) of Norfolk County, VA. By the 1660s, Thomas Fulcher owned land in Lower Norfolk County called “Manor Plantation” that he inherited from his father-in-law John Sibsey. 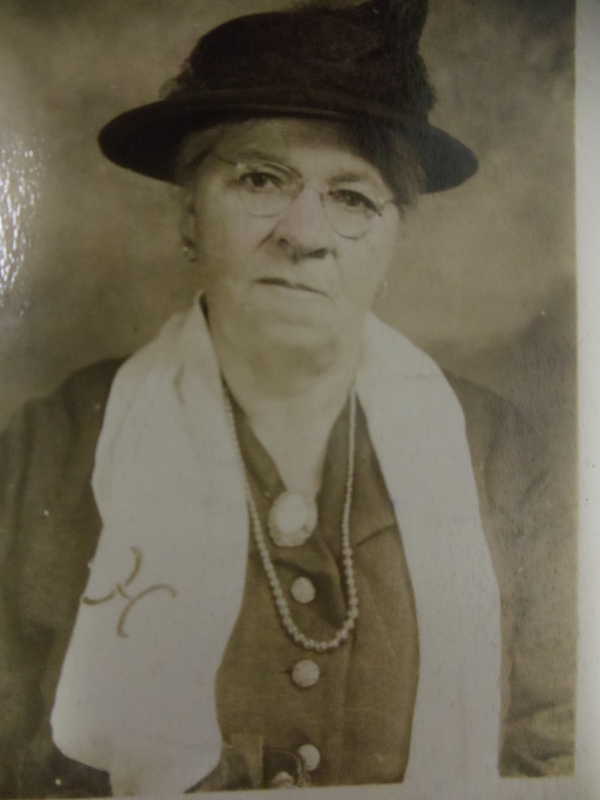 Both the Fulcher and Sibsey families were prosperous and held high status. Captain John Sibsey was a member of the House of Burgesses and Captain Thomas Fulcher was a Sheriff. Upon Thomas’ death, his son John Fulcher inherited “Manor Plantation”. John was married to Ruth Woodhouse and had one son with her but by 1691, the couple was divorced. This can be seen in a 1691 court order in which John Fulcher was held to financially assist his ex-wife Ruth and their son. So when John Fulcher passed away in 1712, it was probably no surprise that he did not leave any of his property to his ex wife and son. However what he did in addition to not leaving his family any property, was unconventional for the time. 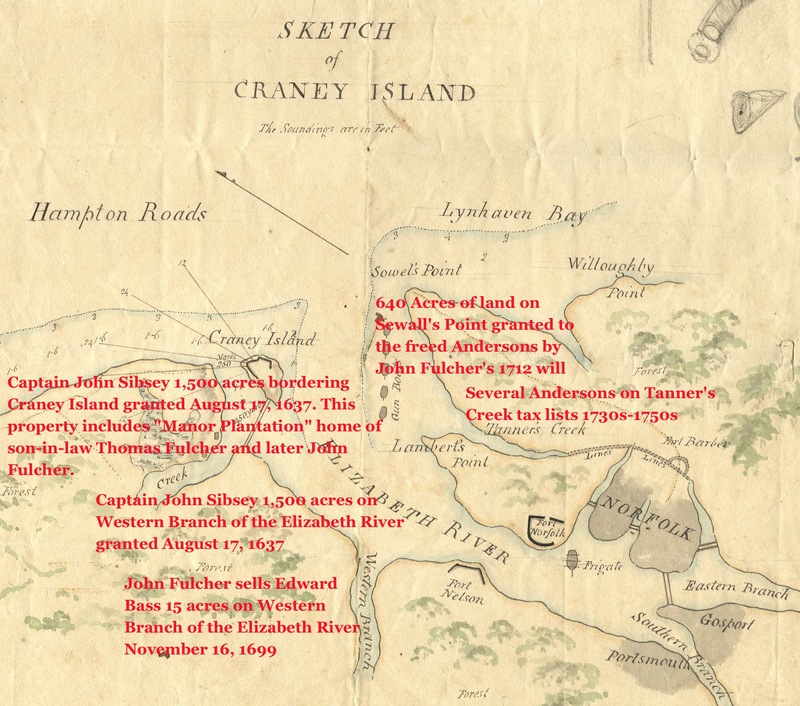 In his 1712 will, John Fulcher requested that all of his slaves be freed and he gave them property to live on, specifically 640 acres on Sewall’s Point in Norfolk County. Imagine what a stir this must have caused. Not only did Fulcher not leave anything to his own family, but he freed his slaves and instead gave them property. Most of Fulcher’s property including “Manor Plantation” went to his “godson” Lewis Conner who also served as executor of the estate. Map of the Elizabeth River in what was then Lower Norfolk County, VA. Shown are approximate locations of Captain John Sibsey’s land holdings including “Manor Plantation” which his grandson John Fulcher inherited. Also shown is the land that John Fulcher granted to the freed Anderson family. Several members of the Anderson family continued living in the area in the proceeding decades after John Fulcher’s death. Edward Bass’ land purchase from John Fulcher is also shown. As you can see the surname of the freed slaves was Anderson with two freed slaves having the Richards surname. They did not take the surname of their most immediate former slave owner John Fulcher, and not all the slaves had the same last name. I do not know how Fulcher’s freed slaves acquired these surnames. Though the colonial government could not prevent the manumission of Fulcher’s slaves, estate executor Lewis Conner did just about everything in his power to remove the Anderson family to North Carolina. The Sewall’s Point land that the Andersons were granted was in the heart of the British colony and was likely highly desired by many individuals including Lewis Conner. In 1715, Conner swapped the Anderson family’s land in Norfolk County for 646 acres of land on Welsh’s Creek in Chowan County, NC (modern Martin and Washington Counties). The Andersons refused to take possession of this land in North Carolina and continued living in Norfolk County. One apparent freed slave of Fulcher’s named James (no last name given) sold his share of the Sewall’s Point land to Lewis Conner in 1715. None of the freed slaves named in Fulcher’s will had the first name James so I’m unsure exactly who this person was but he was certainly formerly enslaved by Fulcher. Over the next several years, there were a number of lawsuits between Lewis Conner and the Anderson family regarding the land and Conner’s role as executor of the estate, but the Anderson family still continued living in Norfolk County. This is evident in a 1718 land deed which describes a path leading to Sowell’s (Sewall’s) Point where “free negroes” resided. And throughout the 1730s and into the 1750s, numerous members of the freed Anderson family and their descendants were counted in tax lists in Tanner’s Creek (located next to Sewall’s Point) in Norfolk County. For these Andersons that remained in Virginia, I have not traced their descendants to the present so I cannot say for certain what happened to them but they may still live in the area. However a couple of Andersons did move to North Carolina and these are the Andersons who intermarried with the Nansemond Indian Basses and became part of Granville County’s Native American community. 1. Lewis Anderson, born 1690. Freed in 1712, he was married to Katherine Bass, daughter of Fulcher’s neighbor Edward Bass. He was taxed in Tanner’s Creek, Norfolk County in 1730 and 1731. Lewis and his wife inherited land in Northampton County, NC in 1748 from his father-in-law Edward Bass which the couple later sold in 1757. It is not known if Lewis Anderson ever made it to Granville County or if he had any descendants. 3. Lewis Anderson, born 1713. He was born after the Anderson slaves were freed, so he was never enslaved. Lewis is thought to be the son of Elizabeth Anderson who was freed in Fulcher’s will. However this is not definite and more verification is needed. 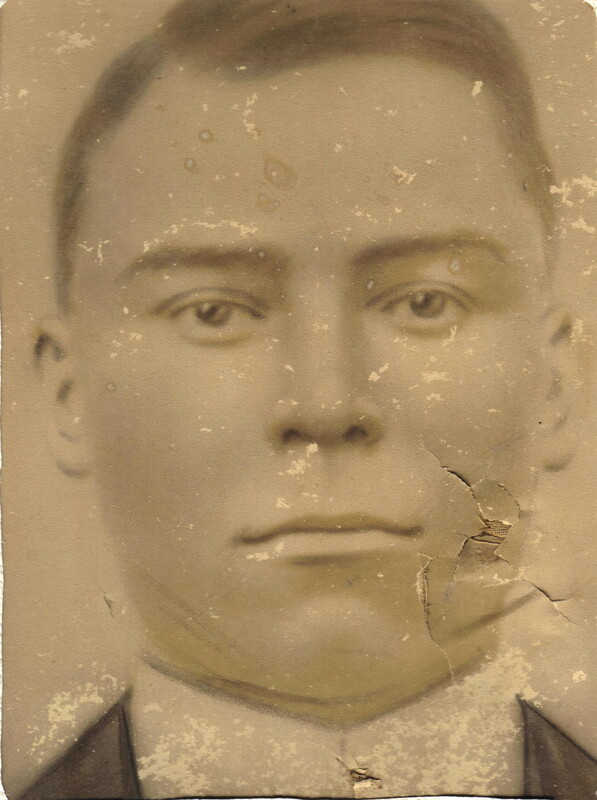 Lewis is the direct ancestor of the vast majority of the Native American/”free colored” Andersons of Granville County because his descendants continued marrying into the Bass, Evans, Taborn, Pettiford, Tyler, Mitchell, Howell and Chavis families. Lewis was married to Sarah Bass, daughter of John Bass 1673-1732. He owned land in Bertie County (modern Northampton County) in the 1730s that his wife inherited from her father. Lewis Anderson was in Granville County by 1746 and enlisted in Col. William Eaton’s regiment which I blogged about here. As you can see, the three Anderson men who moved to North Carolina had Bass spouses/partners. And because brothers Edward Bass (1672-1750) and John Bass (1673-1732) relocated to North Carolina, the intermarried Andersons were included in that move. But who exactly were the freed Andersons? And if they have a Native American tribal origin, what is it? The original Andersons who were enslaved were almost certainly of African heritage but I think it is likely they were mixed Native American. Their very close relationship with the Nansemond Bass family and their association with Indian trader Col. William Eaton are indicators that they also had a Native lineage. However slavery can very much obscure the ethnic origins of those who were enslaved and until we know exactly how and where John Fulcher acquired his slaves, I can only really speculate on the Anderson’s origins. If John Fulcher did inherit his slaves, it seems likely they came from his maternal grandfather Captain John Sibsey. Sibsey’s 1652 Norfolk County will does not make any specific mention of slaves and simply mentions property. But we know John Sibsey owned slaves because Mary Sibsey’s first husband Richard Conquest complained to the courts in 1652 that he was being withheld a slave that was due to him from his father-in-law. Whatever their exact origin may have been, the Andersons who intermarried with the Nansemond Basses, who moved to Granville County and who continued intermarrying with the Native American/”free colored” families living there, were full fledged members of the community. The Andersons have remained one of the largest families in the Granville community as can be seen in the Granville County census records. In 1800 there were 9 Anderson head of households and in 1840 there were 15 Anderson head of households. In the 1850 census which was the first census in which every household member was listed there were 112 Andersons. In 1900 there were 54 Andersons and in 1940 there were 66 Andersons. And of course these numbers do not reflect Anderson women who were married as well as Anderson descendants who no longer carried the Anderson surname. 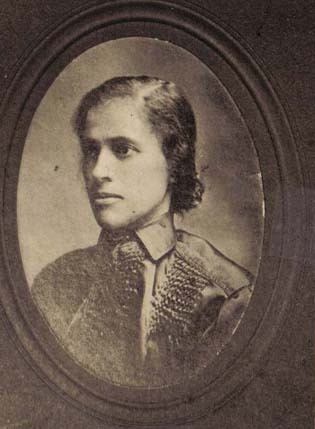 Adeline Jane Howell (1858 – 1900/1910). Daughter of Alexander “Doc” Howell and Betsy Ann Anderson. Married to Dennis Hedgepeth. Resident of Fishing Creek township, Granville County and later moved to Nash County. Lillian Anderson (1882-1932). Daughter of Thomas Anderson and Sarah Tyler. Married to Joseph Walter Scott. Resident of Granville and Vance Counties. Sampson Anderson (1844-1906) with wife Jane Anderson (1852-1923) and son Robert F Anderson (1872-1914). Sampson was the son of Henry Anderson and Nancy Richardson. Jane was the daughter of Mark and Crecy Anderson. The family lived in Granville and Wake Counties and relocated to Washington, D.C. in their later years. Charles Mangum (1871-1944). Son of Junius Mangum and Martha Anderson. Charles lived in Granville County and occasionally lived in neighboring counties of Mecklenburg Co, VA and Wake Co, NC. John Anderson (1832-1916). I have not verified John’s parents but he was first married to Margaret Parker and second married to Mary Mayo. By 1863, he relocated his family from Granville County to Ohio. One of the most nationally known people to come out of the Native American community in Granville is retired NFL player Roger Anderson. 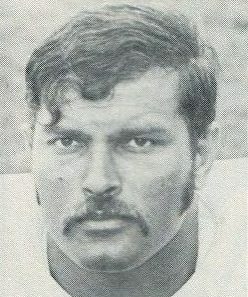 Born in 1942 to the Native American Granville County Anderson, Evans, Chavis, Taborn, and Bass and still living, Roger played college football at Virginia Union and professional football with the New York Giants. Roger was inducted into the Sports Hall of Fame at Mary Potter High School in Granville County. His son Keith Anderson is a member of the Red Crooked Sky American Indian Dance Troupe and is a well recognized and beloved person on the pow wow circuit. Did Sarah Anderson ever live in Loudoun, VA. Do you know of a Elijah or Alfred Anderson from Loudoun, VA. I am a descendant of them. Hello, do you have any info about keziah “cuzzie” Anderson? 1760-1833. No real concrete proof of who her parents were. Theres no documents I can find. Possibly of the Andersons of granville? First, what remarkable research. I plan to do much more reading. I just found you via Howard Evans. Thank you, Howard. Second, It is my understanding that Hester Anderson is the gensis of the Artis line. I have never been able to make the final connection between Adam Artis, who moves to Ohio from Southampton County, VA with his wife Angeline Norfleet from Northampton County, NC. Adam was born in 1813 to unknown parents. Hours in both county courthouses many years ago garnered me lots of info but not “that” info. Some day I am going to read someone’s research and find that they have uncovered the answer to my mystery tangental to their work. I feel a little more enlightened already because of your work. Thanks. Thank you for reading the blog. I’ve done some work on the Artis family but not nearly enough to be able to assist you in making that connection. They are a large family indeed. Best of luck and I hope my research will assist you in anyway possible. Hi Linda! Where are you from? Do you have any Alabama connections my Mother’s was an Artis. As I mentioned earlier in my earlier and long researching I have found out much about Hester and her being the role as the genesis of the Artis family. What has been my brick wall for nearly 15 years or longer is finding the parents of Adam Artis b.~1813. I believe Adam was born in VA based on census records from 1850 forward in OH. He did marry Angeline Norfleet in 1835 in Northampton County, NC. Neither of their names were correctly entered on that courthouse record. I spent hours and hours searching as many Artis related records as I could when there many years ago and found them as Adam Arits and Angy Norphlet in the marriage ledger. The found license does have Artis spelled correctly. Finding Adam’s mother and/or father has come to seem impossible to me. It seems he must connect to Hester but I would love to know exactly now. If you or anyone can assist me with this, you would be helping to put me out of the misery of this search that seems to have no answer. Hi Tonya do you know of any Artis in Youngstown/Alabama connections? My mother’s grandfather is an Artis. Did any of this family end up in Crump or Yazoo, Mississippi? My family’s last name is Anderson and I know my great great great grandfather, Harvey, family was from Virginia and that picture of John Anderson is a spitting image of a few elder members in my family. I find this to be so intriguing. Hello, I would like to know if any of the Anderson family migrated to New York City about 1830. My great great grandfather Thomas G.Anderson is listed as Native American on Marriage records. He was born in 1835. I can find no listing of his parents in New York. Thomas married Sarah Jane Walker.Thank you for any help. My Aunt Jenny/Jinny Anderson lived in Lennox Terrace in New York, City during the 50ties & 60ties. She use to visit us in Washington, DC. Yvonne, Do you know if you could be related to me? 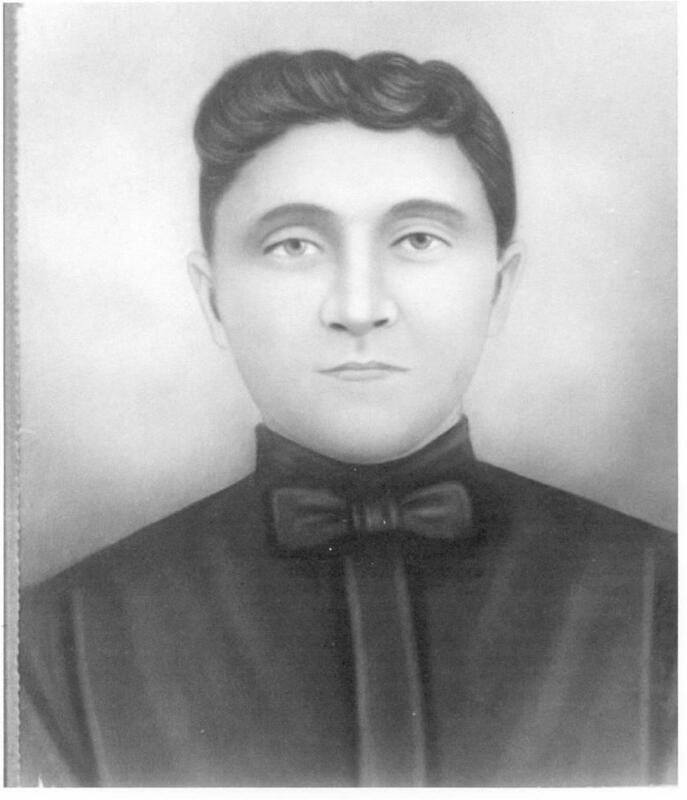 My great great grandfather Thomas G. Had 5 kids. Sarah Lousia, Victoria, Jacob, Thomas Jr. and Winfield whom I don’t think survived. Victoria was my maternal great grandmother.Great uncle Jacob married Mary M. Anderson. My mom grew up with her uncle Jake. Always referred to him as Indian. We still have family in VA,NC and OH. My Andersons’ lived on Staten Island NY. Hope to hear from you. Jeanne. Mary’s maiden name was Robinson. Hey Yvonne. Where in NYC are your family from? My grandmother is Carleen Anderson. I believe she moved from Portsmouth, Va. to NYC with some family in the 50′ or 60’s. Does anyone know if there is a connection between the 4 Scots Anderson prisoners (first names unlisted) brought to VA around 1650 and the freed slaves Anderson. I have read that these prisoners of war are the source of some African American families with “Irish” and “Scots” surnames. Are all the surnames listed connected to Scotts? My 3rd great grandmother was a Scott out of Henrico, Virginia?